Pleasantly-textured jellyfish, seasoned with just the right level of sourness. Simply defrost in the refrigerator and enjoy. Can be eaten as an hors d’oeuvre or with vinegared or pickled dishes. Depending on the country you live in, jellyfish can be difficult to find either fresh or frozen. Sugarlady’s frozen jellyfish allows you to have some handy anytime you wish to use it, and comes already seasoned and ready to eat in case you wish to try jellyfish but do not have experience in preparing it. Many similar commercially available products use sweeteners (sorbitol), sourers (citric acid), preservatives (sorbic acid K), or chemical seasonings. Sugarlady’s seafood is acquired in season and processed right away, ensuring that you always receive the highest possible freshness and flavor. Sugarlady’s seafood and other frozen products allow you to cook meals from all sorts of real, nutritious ingredients whenever you desire, even on the busiest of days! Defrost the jellyfish in the refrigerator. Once defrosted, the it can be eaten as-is. 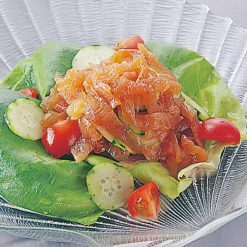 It can also be paired with finely sliced cucumber and other ingredients, using the specially-seasoned sauce that accompanies it as dressing.The jellyfish comes with a relatively large quantity of this seasoned sauce; feel free to adjust how much of it you utilize depending on how you are eating it. One way to use the sauce is to soak and pickle a cucumber in it (cut into round slices), then serve the jellyfish and pickled cucumber together as a delicious snack or side dish. 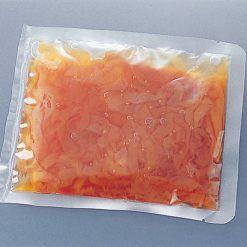 This product contains jellyfish (Thailand), sugar, soy sauce, rice vinegar, flavoring extract (yeast, katsuo (bonito), kombu seaweed), sesame oil, table salt, (this product contains wheat).. The recommended shelf life for this product is 13 months. Origin of ingredients: jellyfish (Thailand). Prepared and packaged in Japan.